As stated in the title of this entry, these are not boring turkey burgers. I felt it necessary to state that because, sadly, turkey burgers can be a little boring. Sometimes a little bland and lacking in flavor, I think turkey burgers have gotten a bad rap. I’m here to remedy that, and share with you our recipe for turkey burgers that are juicy, full of flavor, and not boring. This lovely version sits on a bed of arugula, is slathered with a tomato and onion compote, and topped with melty cheese, all on a pillowy brioche bun. There’s certainly nothing boring tasting about any of that, and if you’ve got the grill fired up, it adds even more layers of flavor. Don’t worry though, they are just as delicious made in a skillet on the stovetop. In a large bowl, place turkey, minced onion, celery. garlic, seasoned salt, cumin, paprika, Worcestershire sauce, egg, and 1 tablespoon olive oil. Mix well and set aside while you make the tomato and onion compote. In a small saucepan over medium heat, place the remaining tablespoon of olive oil and the sliced red onion. Let cook until softened, about 3 minutes. Add 2 tablespoons water, grape tomatoes, and malt vinegar to the pan. Season with a pinch of sugar, salt, and black pepper. Let simmer over medium-low heat until the tomatoes have broken down and the liquid has thickened, about 5-7 minutes. In a large skillet over medium heat, heat one tablespoon of olive or vegetable oil. Form the turkey mixture into four patties. Carefully place in skillet. Cook until done, about 5-7 minutes each side, depending on the thickness of the patties. 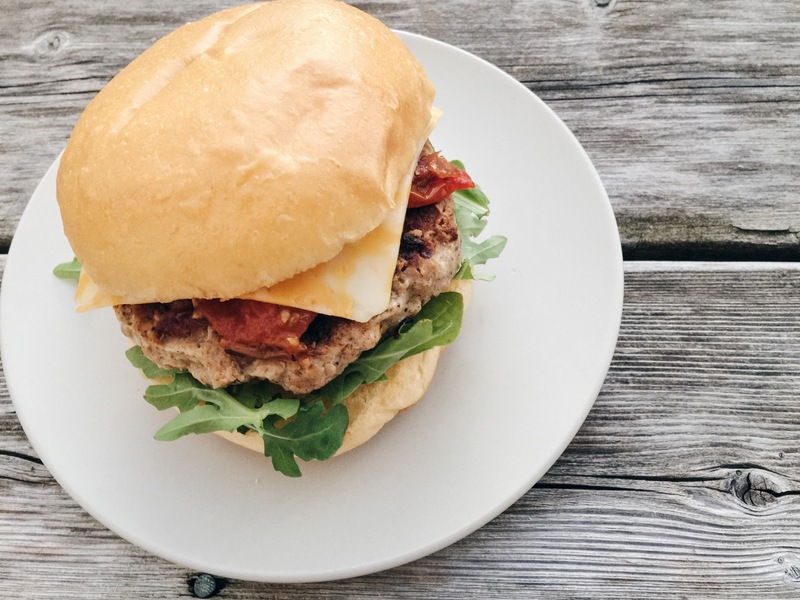 Assemble the burgers by placing a layer of arugula on the bottom of the brioche bun, topping with the burger, tomato onion compote, cheese, and the top bun. Serve immediately. These are great with sweet potato fries or plantain chips on the side. 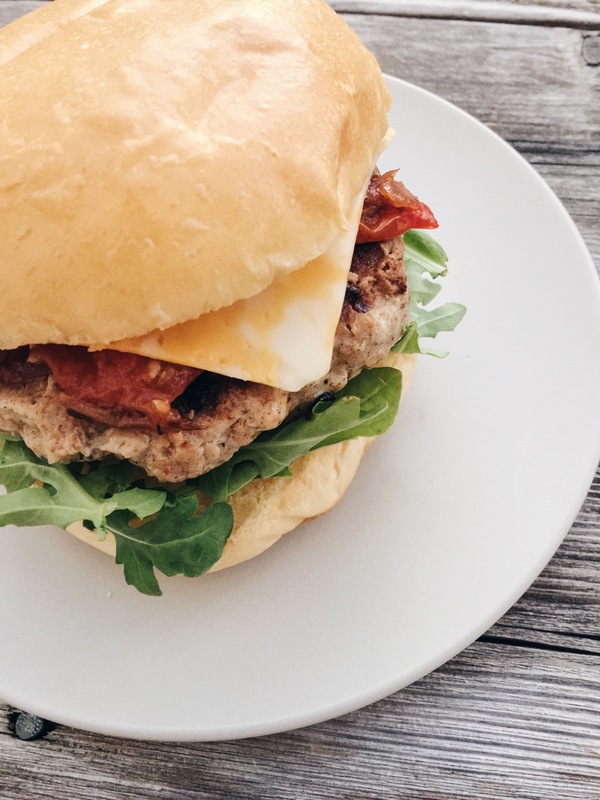 May your turkey burgers never be boring again. Enjoy! I’m going to have to give these a try because my turkey burgers are always boring. I think you have the right combination of flavors going on here and these looks tasty and delicious. Thanks, Ali! I hope you enjoy them! We definitely don’t think turkey burgers are boring. We always add some sundried tomatoes and feta to ours too. Yum! Those are definitely great flavor additions! YUM! These sound so good! I always feel like I have to add so much fat to turkey burgers to get them to be flavorful. Gotta try these out! oh man.. I haven’t eaten a turkey burger in YEARS and I LOVE THEM!! If I think the normal ones are good, these must be out of this world lol. Love the seasonings! Thank you! They were so tasty! I hope you’ll give them a try! These Turkey Burgers look TASTY! I am getting hungry looking at them. Can’t wait to try this recipe.